With a variety of credit card processing options, low flexible rates and no charges for converting your existing terminal, FTD Cash-Flo is an affordable way to manage credit card transaction costs. We make it convenient to use your existing terminal or allow you to select from a variety of equipment options offered by FTD. 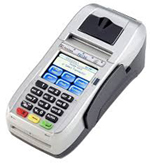 FD130 - All in one high Speed credit card processing terminal with built in printer, pin pad and EMV/Chip reader. For pricing and payment options, please contact FTD Cash-Flo and our representatives will work with you to customize a plan that best suits your shop's needs. For more information or to sign up, contact FTD Cash-Flo at 800.788.9000 ext. 7246589 or cashflo@FTDi.com.